On the sign to the right the letters and border have been left raised and the background was blasted away. For more contrast the letters can be stained black before blasting the background away. We have a number of standard sizes as shown below. 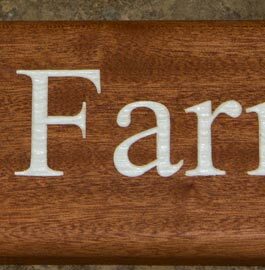 These will work out a little cheaper than made to measure wooden house signs. The alternative method is 'Made to Measure'. Here you choose the size of the timber which can be up to 12inches / 300mm high. The wording can be laid out any way you choose. 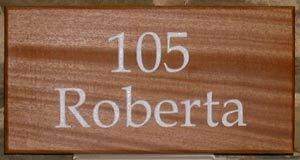 We can make even larger name plates - just ask for a quote. If none of the above styles suit your requirements, if you want a sign of a specific size use the chart below. We can cut the timber to any size. If it is easier - then tell us what you require and we will send you a quote. Please note that with 4" high and 6" high signs the timber is approx 18 - 22mm thick and on larger signs it is 25-28mm thick. There is a sizing and layout tool you can use for made to measure signs. Made in the UK. 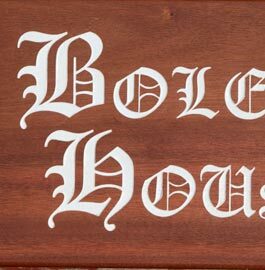 Our team at The Sign Maker looks forward to helping you with your wooden house sign.